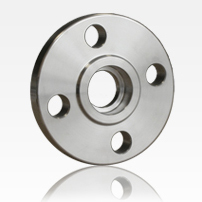 Socket Welding Flanges were initially developed for use on small size high pressure piping. When provided with an internal weld, their static strength is equal to, but their fatigue strength 50% greater than double welding slip-on flanges. Smooth bore conditions can readily be attained (by grinding the internal weld) without having to bevel the flange face and, after welding, to reface the flange as would be required with slip-on flanges. The internally welded socket type flange is popular in chemical process piping for this reason.